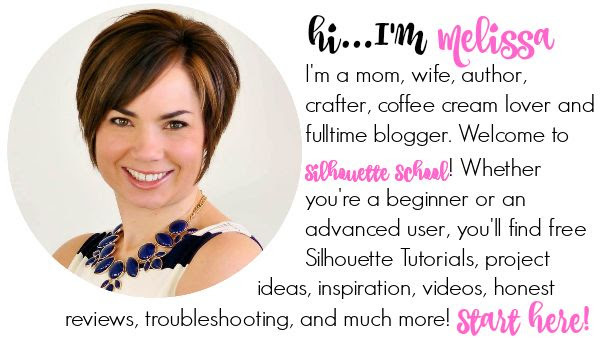 Silhouette CAMEO 3 Not Cutting? Here's Why! 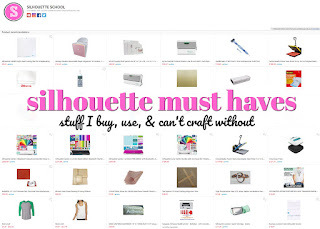 If you're having trouble with your Silhouette CAMEO 3 not cutting there are a few reasons why. 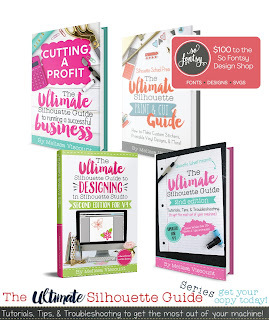 Don't worry - you don't need to send the cutting machine back, you just need to know what to look for so you can trouble shoot. 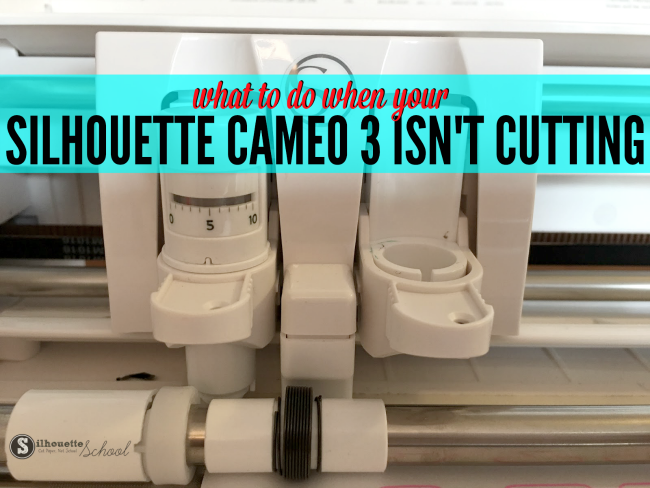 The most common cause for the Silhouette CAMEO 3 not cutting or not cutting through is a problem with the blade - specifically the Autoblade. If you are using the Autoblade in your CAMEO 3 it's important to make sure it's loaded into the blade carriage correctly to ensure it cuts. The Autoblade can only be used in the left carriage in the Silhouette CAMEO 3. The grooves on the back of the Automatic Blade should line up with the grooves on the left/red carriage on the CAMEO 3. 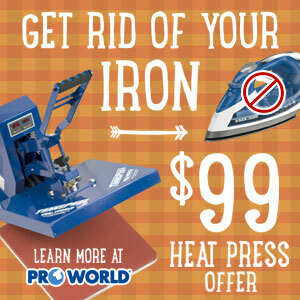 Press the blade completely down and then lock it into place by pressing the tab all the way in. Here's a picture of the autoblade correctly positioned in the carriage. If it looks like either of these two pictures, it won't cut correctly. In addition, make sure the blade is locked into place. When it's locked the circle on the locking tab will turn dark green. 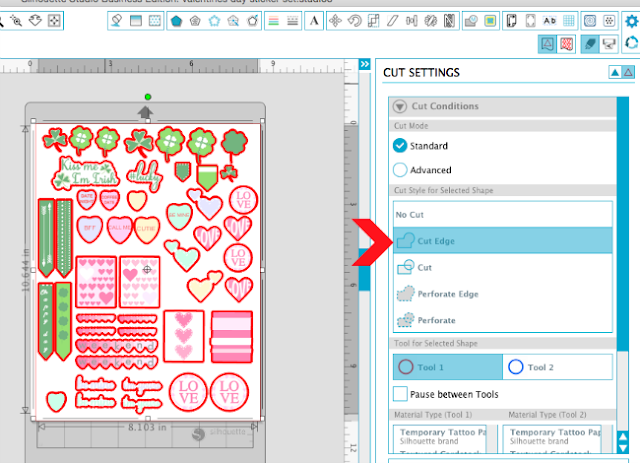 If the blade is correctly positioned in the Silhouette cutting machine, but the CAMEO 3 still isn't cutting correctly the next thing to check to make sure you have the correct blade selected in Silhouette Studio. 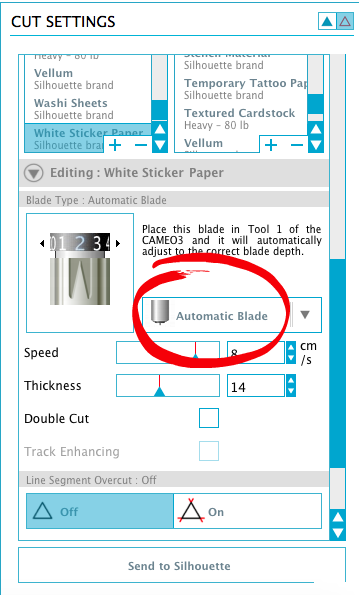 When the CAMEO 3 is found, the Cut Settings window will include the AutoBlade in the Blade Type drop down menu. However, it's not the default. If you don't change the setting to the Autoblade the machine will think you are using the manually adjusted ratchet blade and will not adjust the Autoblade's blade depth resulting in no cut or a partial cut. 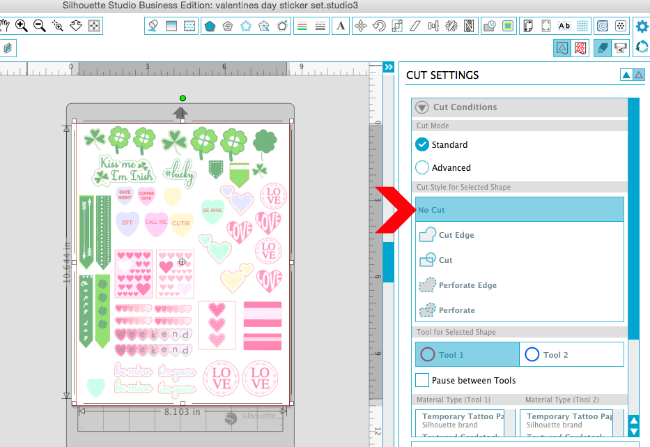 If the Autoblade is correctly in the carriage and you have it selected in Silhouette Studio, but the machine is not cutting anything - check your cut lines. 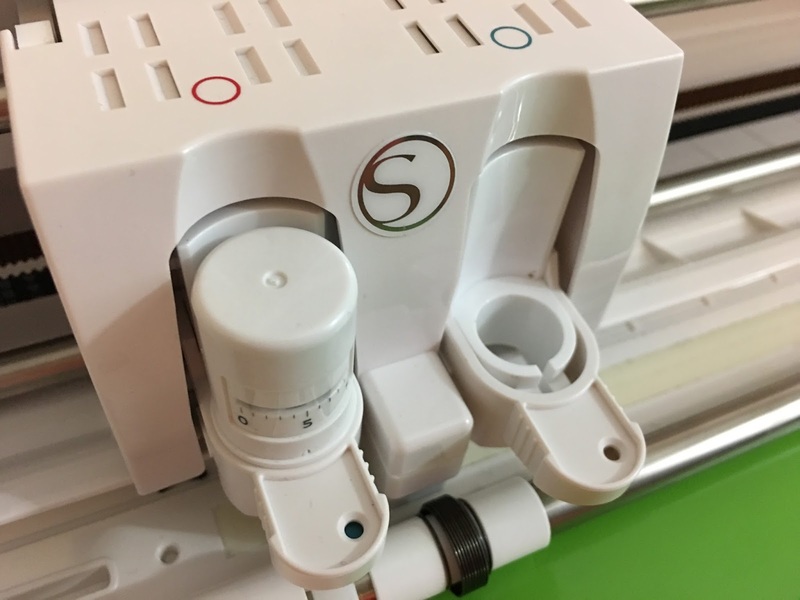 If the machine appears like it's going to cut and then says "Job Complete" without cutting anything, the cut lines are not on. 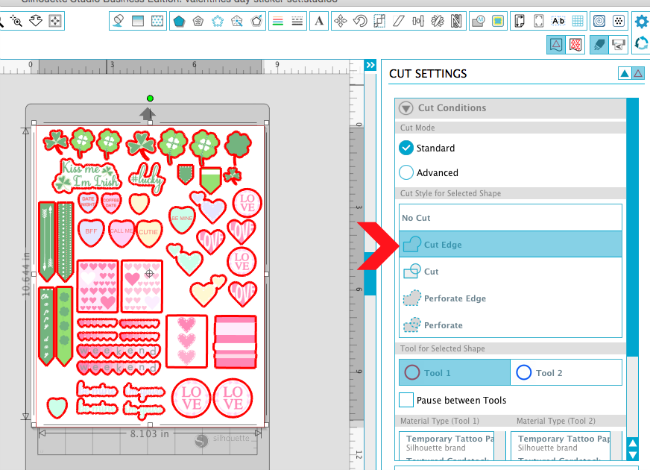 Go to the Cut Settings window and with the designs you want to cut selected, pick "Cut" or "Cut Edge". If you are using the ratchet blade in your Silhouette CAMEO 3 you can use it in either blade carriage. If the Autoblade isn't cutting correctly I always suggest testing with the ratchet blade as well. If the ratchet blade isn't cutting in your Silhouette CAMEO 3 there are several things to check. First, make sure you have the blade press down into the carriage, with the fin facing directly toward you and that it's locked into place. 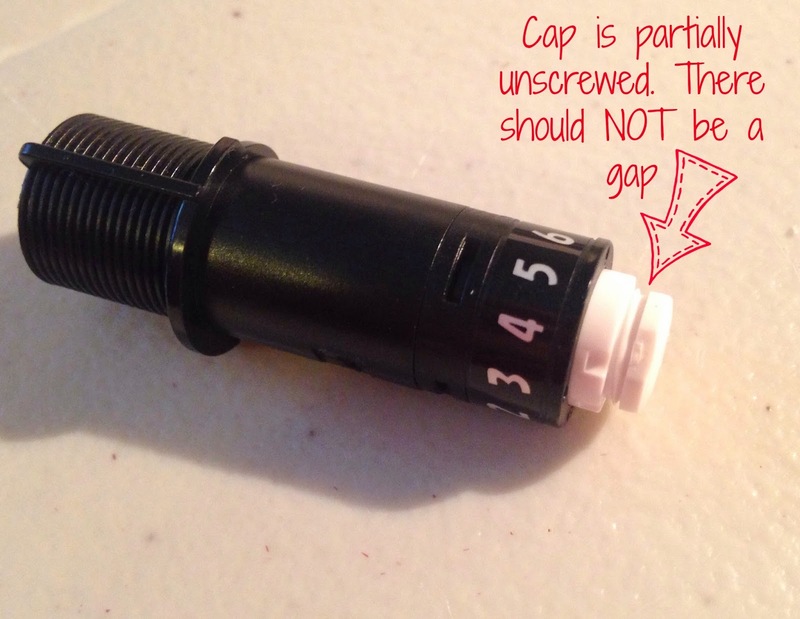 You'll also want to make sure the white cap is screwed on completely. If the white cap on the very end of the blade is not completely screwed on it will prevent the blade from reaching the material and therefore it can not cut. Twist it until it's hand tight. Finally, you'll want to check to make sure that nothing is obstructing the blade such as dust from paper cuts or a small piece of vinyl. 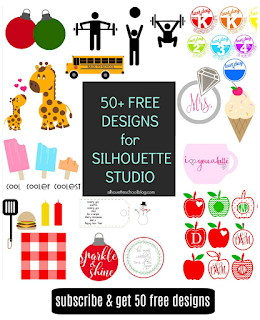 Looking for more reasons why your Silhouette CAMEO isn't cutting? Check out this post which focuses on troubleshooting cut problems with the CAMEO 2, CAMEO 1 and Portrait. My local Michaels only carries the cricut glitter vinyl. Is it thicker, so should the setting be different? Could very well be user error. Lol. But, my project is ready to go with cut edge, cut lines. Is something wrong with my machine? I'm going to get a ratchet blade soon and see if that helps. I was cutting card stock and my cameo 3 was not cutting through all the way. Then I was cutting vinyl tonight and it cut all the way through the backing. I noticed after the cut the autoblade was on 7. Shouldn't it have set itself on 2 for vinyl? what if it's not cutting right and you are using the ratchet blade? I really hate this machine. ugh. I want my old one back. Hi! I just replaced the original blade I bought in December for a new one (automatic)since I wanted to start cutting cardstock in addition to the polyester film I've been using for a few months very successfully. Since I replaced it, I've been battling several issues. 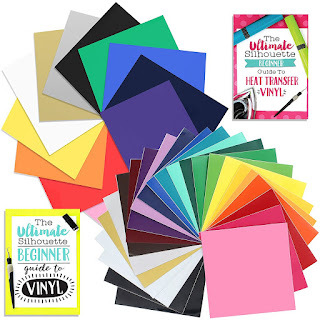 These includes blade ripping the cardstock, blade not cutting all the way through, blade cutting the perforated lines so much that they totally detach everything and so forth. I went back to the polyester film for another project and again the blade is not cutting through, but only in some places. Like parts of my image are correctly cut and others only scored. I unplugged everything, let it rest for an hour and plugged it back in. Same problem. What is going on?? This is taking all my patience, my cardstock and my sanity!!! Please help! My problem, is it is cutting way to deep. All the way to my sticky board. If the blade was not in correctly, then I would think it would not cut well. Mine is cutting way to well. Any advise? Thank you so much for this!! My machine wasn't printing and I was trying everything and getting so upset. I have an autoblade and from reading this the final thing I tried was seeing if the cap on the blade was not fully screwed in... that was the problem. As soon as i fixed that, i was back to cutting! Thank you!!!!!!!!! 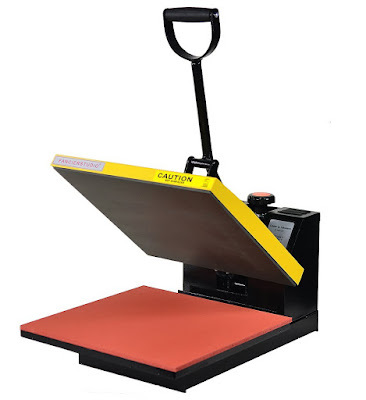 I can't get the autoblade to work at all- I use the recommended setting and it cuts all the way through to the mat, I adjust the force setting/ depth settings, and it won't cut through at all- it barely leaves an impression. I wasted almost an entire roll of heat transfer vinyl and still haven't gotten it right.